This is the last issue before the two-week Xmas break. The next New Worker will be out on the 9th January. AMBULANCE services and Accident and Emergency units throughout the country are struggling to cope with an “unexpected” rise in demand, even though winter has barely begun. 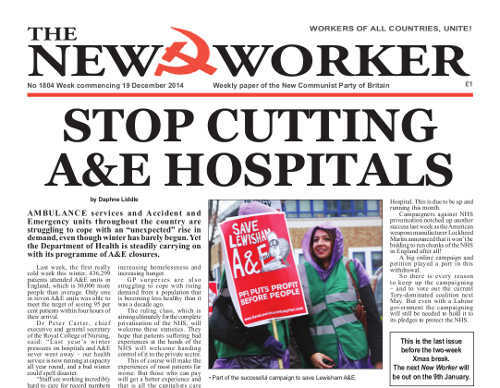 Yet the Department of Health is steadily carrying on with its programme of A&E closures. Last week, the first really cold week this winter, 436,299 patients attended A&E units in England, which is 30,000 more people than average. Only one in seven A&E units was able to meet the target of seeing 95 per cent patients within four hours of their arrival. Dr Peter Carter, chief executive and general secretary of the Royal College of Nursing, said: “Last year ’s winter pressures on hospitals and A&E never went away — our health service is now running at capacity all year round, and a bad winter could spell disaster. Or as John Lennon went on to say “For rich and the poor ones the world is so wrong.” Well that’s certainly not the case for the rich. Every day is merry for the rich parasites who live like Roman emperors through the capitalist system that guarantees them leisure, health and everything money can buy — all off the backs of the working people they exploit and oppress. But for the poor the capitalist world is indeed so wrong and no more so than in the so-called season of goodwill. For some of us Christmas is, indeed, a welcome break from the drudgery of work — a chance to put one’s feet up, eat and drink and enjoy the life the rich enjoy in their mansions every day of their worthless lives. For others, the homeless, unemployed and destitute victims of the worst slump since 1929 it’s just another day of despair. The festive platitudes of the politicians and the princes of the church are meaningless to them. The rulers of all the heartlands of western imperialism embrace Christianity in one form or another. But Jesus of Nazareth, whose birthday we are supposedly celebrating, barely gets a look in these days.